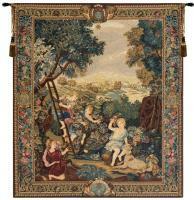 Morning in Pinewood is an Italian jacquard wall tapestry. The artwork comes from the second most popular painting in Russia by Ivan Shishkin completed in 1889. Four bears frolic in the deep woods. The detail and realism of the subjects and the wood entrance the viewer instantly. W 32" x H 24"/W 63" x 48"